One choice will define you. What if your whole world was a lie? What if a single revelation like a single choice changed everything? What if love and loyalty made you do things you never expected? Told from a riveting dual perspective, this third installment in the series follows Tris and Tobias as they battle to comprehend the complexities of human nature and their selves while facing impossible choices of courage, allegiance, sacrifice, and love." 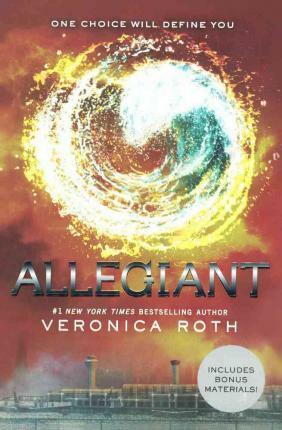 Bonus Materials Include: Updated Faction Histories Q&A with Veronica Roth Allegiant Discussion Guide Excerpt from Four"
The tragic conclusion, although shocking, is thematically consistent; the bittersweet epilogue offers a poignant hope. --Kirkus Reviews"